0.1 How do infrared heaters work? Have you got anything to keep you warm this winter? Maybe you came here from hearing (or reading) about infrared heaters being super-efficient. Maybe you are looking for the best infrared heater for your home. Whichever the reason is, you’ve come to the right place. Here, we are going to first show infrared reviews which include 5 different products. Then we will help cater you towards the right product you should get. Each product has its own advantages and disadvantages, depending on your needs and limitations. Instead of compiling them by brands, such as having Dr infrared heater reviews or Lifesmart infrared reviews only, we believe in finding the best among the best. And don’t forget to read our safety tips to keep your winter nights warm without accidents! We urge every reader to at least give that part a visit. You have probably known infrared from your science class or your old phones which featured data transfer using infrared. But what is it, exactly? Infrared is a type of light that is invisible to the eye, unlike sunlight. But the mechanism is the same. The sun is far enough that we won’t feel the heat just because it’s day. The light has to reach us for us to feel the heat from the sun. Certain types of infrared heaters can emit visible light due to the wavelength they emit. Home use infrared heaters may or may not emit such light (which usually means they are really hot). Infrared heaters work similarly, except that we cannot see the light. Infrared heaters radiate electromagnetic heat which warms up things right in front of it almost immediately. Getting close to one will surely make you feel hot. Which is not safe to do, so we don’t recommend leaving your kids or pets around one just because they feel quite warm. It will also cause deterioration on the skin when exposed for too long. Infrared heaters are often deemed to be very energy efficient because of how they are easily absorbed by the skin. Just like how we feel warm quickly enough under the sun, the infrared heaters work similarly. The heat is not just thrown into the air, but absorbed by objects. The different types of infrared heaters are divided based on their wavelength. There are three types from long wave, or far infrared, medium wave, or medium infrared to short or near infrared. Longwave or far infrared heaters are what we usually get for commercial uses. These are the most suitable heaters because the heat they transmit is usually enough for a room and heat is easily absorbed into the body. The reason is that this wavelength comes with high humidity which suits the condition of our skin.This is also the type of infrared that does not emit visible light. Wavelength runs above 3 microns and typically runs up to 100°C. Medium wave or medium infrared are the heaters that people will use to heat up huge space at once. 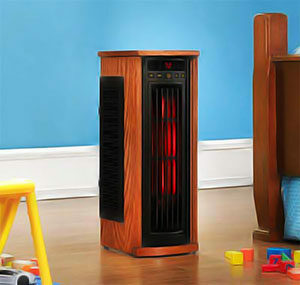 While long wave heaters are great for home use due to its low risk, medium heaters emit deep red light on its bars. These indicate that they are running at higher than 500°C until 1000°C, making it easy to heat up your freezing backyard for BBQ. Most infrared heaters operate based on electricity, which is safer compared to those burning on fuels. That is also why we recommend only electric infrared heaters. Shortwave or near infrared heaters are the types that emit up to 3000°C and is usually for industrial uses. Definitely not the type you bring home and keep in the garage to heat up the home. As the name implies, a gas infrared heater operates based on gas, usually propane. The difference is that instead of electricity, this gas fuels the heat to the coil that will radiate the electromagnetic heatwaves out. The drawback of a gas infrared is the fact that it runs on propane, petroleum or natural gas which can leak if the system is not maintained properly. Thus, unlike electric infrared heaters, gas infrared heaters are expensive and less safe to use considering the gas leakage probability and how it’s easier to catch fire that way. All the heaters featured here are electrical infrared heaters. Our infrared heater reviews here do not include gas type as it does not possess quite similar advantages, although produced heat is the same. You can read this in the section just right above. 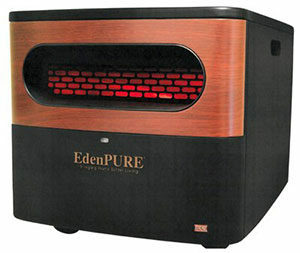 The EdenPURE Gen2 Infrared Heater has a very vintage look to it. We genuinely love how it looks and would definitely love to add another aesthetic and functional furniture into the room. The product has a 2-year warranty and comes with a thermostat to control how hot it should be running. Upon turning on, depending on the heat, it will glow warm red, indicating it’s working. Comes with remote control and operates on 1500 Watts. High capability of heating up to 1000 square feet area. An electronic thermostat that allows you to control heating as small as one-degree increments. “Quiet Mode” to keep the room warm and serene for other activities. Easy relocation with built-in recessed handles. The washable filter will stay for a lifetime. You just need to maintain it every now and then! No exposed heating elements, so you don’t have to worry about things catching on fire or pets and kids burnt from touching it. Overheat protection sensor will keep you safe as it shuts off the heater when passing a certain limit. Con: We consider this as a costly option for an infrared heater. Although it does have impressive abilities and reliability. 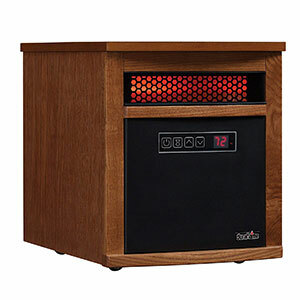 Another impressive infrared heater which also claims to be a space heater. 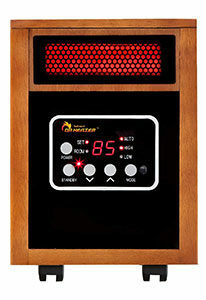 Dr Infrared Portable Space Heater operates on electricity from1000 to 1500 Watts. Similar to EdenPURE, it also comes with a remote control which can turn the heater on and off as well as control the thermostat. The marketing touches on several big advantages of an infrared heater such as energy-saving and fast heat dispersion. Comes with a remote control but the heater has to be turned on manually from the unit itself and then operated from the remote control. This is a safety feature they have to follow from UL. Auto Energy Saving Model helps you save even more energy while staying warm. Safety mechanisms include tip-over protection that shuts the unit down automatically. Overheating is also prevented as the unit shuts down when passing a certain temperature. The unit also comes with a timer that automatically shuts the unit off after 12 hours. The dual heating system includes an infrared quartz tube with PTC. Low noise as low as 39 dB. Electronic Thermostat that ranges from 50-86 degrees. Con: As much as it wants to say that it is a space heater, the shape prevents it from emitting heat into various directions. If you want it to heat up a big space, place it in the corner where it can radiate electromagnetic waves across the room. We have done several Duraflame infrared heater reviews, but here’s something else from the famous brand we want to review. That is the Duraflame 9HM8101-O142 Portable Electric Infrared Quartz Heater. As the name implies, this heater’s heating element is a quartz tube which is famous to be the material that helps it easy to emit heat almost immediately. 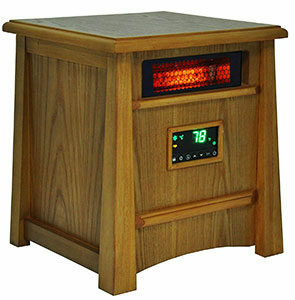 The infrared heater works on 1500 Watts and comes with a remote control to control the thermostat and to turn it on and off. High capability with 5200 BTU power to heat up to 1000 square feet area. Safety mechanism where overheating will be dealt with by the automatic shutdown of the unit. It also comes with a timer that will shut off after a certain time has passed. Quartz heating element is the best material to get that instant heat without any necessary preheating. Easy to relocate with caster wheel that rolls to all direction. No need to carry it around! Con: This is not the quietest infrared heater around as it does have a fan working inside it. But it does help disperse the heat equally across the room as well. The Lifesmart Infrared Deluxe is something that we would highly recommend to people in need to a heater to keep the big living room warm. Yes, it has high capability, but does not necessarily try to burn a bunch of fuel or takes up a huge space in there. It is stylish, warm and not overpriced. The infrared comes with a remote control that can turn it on/off as well as control the thermostat. You will see a lot of positive reviews on Amazon and we’re another one of them. High capability of using up to 1800 Watts to heat up the area. Most of the time, it will pull at 1400 Watts, but 1800 Watts is possible, you need to watch out to not trip the breaker. Be efficient with three different settings to use depending on your needs. Eco settings allow it to run at 500 Watts and emit heat at 68 degrees. Safety mechanism where overheating will be dealt with by the automatic shutdown of the unit. It also comes with a timer that will shut off after a certain time has passed. It also automatically shuts down when tipped over or knocked over hard. Quartz heating element is the best material to get that instant heat without any necessary preheating. Lifesmart has 8 quartz operating in it, which is one of their best features. Con: If the product works, it’s great. The issue here is that Lifesmart needs to improve on quality control as well as customer service. We find a lot of complaints regarding the issues on the damaged product upon arrival (which may happen during the transportation). Our last Lifesmart infrared review will be the Large Room Infrared Quartz Heater which is quite impressive. Similar to its counterpart which runs at 8 quartz heating elements, this one runs with 6 and heats up to 1400 cubic feet. Lifesmart 6 Element Infrared Quartz Heater comes with a remote control to turn it on and off and to control the thermostat from where you are. High capability with 5100 BTU power to heat up to 1400 cubic feet area. Quartz heating element is the best material to get that instant heat without any necessary preheating. This particular heater has 6 Quartz inside, which means faster and more intense heat is emitted. Safety mechanism where overheating will be dealt with by the automatic shutdown of the unit. It also comes with a timer that will shut off in up to 12 hours. It also automatically shuts down when tipped over or knocked over hard. Be efficient with three different settings to use depending on your needs. Eco settings allow it to run at 500 Watts. Con: As mentioned before, the product itself has little drawbacks worth mentioning. But it has very poor customer service and product control, making the chance to land on a damaged product easily. Rough transportation may also be the case that it stops working after a few days or weeks of usage. Purchasing an infrared heater is sure to bring changes into how you warm up and how your electric bills will change. There are many good things about it, but consideration has to be made carefully. Location: You may need a bigger heater for a wide or outdoor location. Depending on the room as well, the heater may take a longer time to keep you and the room warm. For example, if you want to heat up your basement which has a ceramic wall, you may need to turn the heater on much longer. Some materials keep and contain heat for a very long time as they are not that good of a conductor. Electric or Gas-based: There are two types of infrared heaters and if you have read the whole review, you know we are reviewing only electric infrared heaters here. Gas infrared heaters usually use propane which does not usually emit fumes. But the fact they operate based on gas concerns many people, making electric infrared heaters a better preference. Maintenance: An electric infrared heater is very simple. You just need to regularly wipe off the unit, especially the reflector surface every week or so. Dust isolates heat, so to keep your home safe and the unit to work properly, establish this habit. Children and pets: Must keep away from the heater as much as possible. Touching the tempting glowing red parts of the heater will definitely burn. Although heaters do come with a protective case that keeps it as cool as possible to the touch, do not let them be available to the reach of especially your kids. Buy a toddler lock if the heater does not come with it. Electricity: Remember that a typical infrared heater uses 1000 to 1500 Watts of power, which is quite huge. Before purchasing, check that you are not going beyond the limit that is allowed in your home. Especially during initiation, your heater should be turned on first before anything else as it does not use as much electricity afterward. Reviews: Contain the most critical commentary of other buyers. Our reviews help you see the pros and cons of the product, but experiences help you know the overall results of purchasing the product. Remember that a heater has to be durable and contains 0 fault/damage when arriving. You cannot risk it melting or burning just because you left it 10 minutes to get some snack by a minimarket. Quiet! In fact, these silent heaters are typically favored due to how they warm up at night without making a sound. They do not run on fans nor does anything burn inside it, only electricity that keeps the coil hot and emits heat. Efficient because they do not warm up everything inside the room. It is not the type that heats up the air and circulation before you start feeling warm. Instead, it hits your skin directly and the heat is absorbed immediately. 5 minutes to get warm and cozy without too much-wasted Not to mention that despite the wattages, these heaters do not need to be preheated for too long! Less risk of fire. Due to how it does not burn on anything, you do not have to worry about a fire breaking out from your heater from spilling fuel. It also rarely causes anything close to catching on fire, but it might cause damages when placed too close, just like any other heaters. No pollution! If you want to live green without causing environmental damages and health risks, this is the best choice for you. No fuel means no fumes are formed at all. No risk of inhaling dangerous, toxic fumes and protect the earth from such destructive pollutants! Turn off the heater when not used. There is no need to increase your electrical bill and increase the chance of fire hazard when no one is home. Especially healthy adults who know how to operate the heater has to be home if you want to use it. 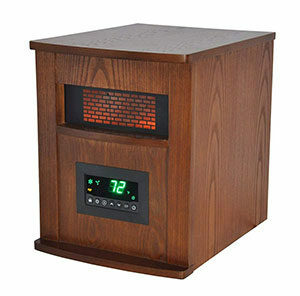 An infrared heater has an instant heating feature anyway, so you don’t have to preheat it. Set it at a wanted temperature only. No need to rush it by dialing on max heat and then reducing it later. Too hot can cause skin and eye damage on close range especially with an infrared heater. This is the reason that your electric bill is increasing as well. Shut down immediately when you smell burning sensation or when the heater is making weird noises. Do not operate or try to fix at your own costs. Have it brought to the expert or call Amazon for a refund if it’s still within the guarantee period. Maintenance is necessary if you want a heater that lives for a long time as well as to eliminate a fire Dirt and dust are great heat isolator, making it easy to overheat, so clean it when visible and not operating. Keep a distance from the heater of things especially the ones that are flammable and easily catches fire. Obviously, do NOT hang your laundry on the heater. Keep a safe distance from the heater or if there is no way to do that, make sure it is not facing directly into an object. Read the manual. We can’t emphasize more on how users must read the manual before complaining about any sorts of problems. This might solve your problem but it will also fasten the process when employees know that you’ve followed and tried everything on the manual. Q1. Are infrared heaters energy efficient? Yes. Infrared heaters do not try to warm up the whole room slowly but direct the heat to any solid object around it. Your skin immediately absorbs the heat and that’s why, upon turning on the heater, you will feel warm almost immediately. Energy is not wasted too much this way. Q2. Are infrared heaters safe for home use? Yes, absolutely! Infrared heaters do not emit toxic fumes like those which burns on fuel would. This eliminates the health risk from it. There is also the fact that it has very low fire risk as no actual fire is burning. It’s often referred to as the environmental-friendly option for heaters as well. Head to our safety tips section for more information! Q3. Are infrared heaters safe to use in a work area? Yes, similarly for home use, except that you might need a heater with higher capabilities and lower wavelength. Find something that is of the right size for you and remembers, no heater can automatically make the whole room warm in an instance. Especially if you have ceramics laid out that are already freezing cold. Q4. Is it safe to operate an infrared heater all night? Yes, but with cautions. Most of the best infrared heaters have the auto-off feature which will shut the heater off after a certain amount of time. Some also have a built-in mode to shut off when the temperature rises to a certain point. However, infrared heaters are one of the safest heaters as its mechanism does not involve actual fire burning at all. The only concerns for typical infrared heater users are dry skin when you dial it up for too high. We recommend lowering the temperature of the heater when you sleep. Sleeping humans have lower body temperature and you will be sleeping under your blanket anyway. To be extra safe, if you need to leave the heater on all night and unattended, put an alarm just to wake up and check and that it’s off as how it’s supposed to be. On nights that are not too cold, you can also opt to warm up for a while and layer upon blankets instead. There are many types of heaters for alternative aside from the infrared heaters. Each of them has their own strengths and weaknesses. So, we’ll start with the most common comparisons readers want to know. The heating rate of the two heaters is different in that ceramic disperse heat into the room and slowly warms it up. It eventually warms up you and anyone else entering the room right after. But infrared heaters only emit heat on a straight line. It heats right where the wavelength or light touches directly. An infrared heater, thus, does not require preheating. But this also means that walking out of its reach would mean that cold will instantly fall upon you. But a ceramic heater would definitely need to be preheated. Ceramic heaters that are left for too long would be too cold to instantly heat up the room. The energy efficiency of the heaters would depend on how you like to be warm. An infrared heater heats up almost the moment it is turned on, but it does not necessarily warm up the air or a big a room depending on the BTU. But a ceramic heater warms up the air in the room which subsequently heats up objects and you as well. Infrared heaters heat you inside out and a ceramic heater works the opposite way. If you live alone and wants a heater that warms you up right then and there, a single unit of the infrared heater is usually great. But if your family wants to stay warm in the living room, the ceramic heater has the advantage. Safety-wise, both heaters have pretty much similar risks as they both work on electricity (except for gas infrared heaters). Many fuel-based heaters work similar to a ceramic heater, so we won’t be discussing heating rate and energy efficiency. We’ll talk more about safety and environmental side-effects of both types of heaters. On TL;DR note, safety risks of an infrared heater is very low. It does not burn on anything which means no fume to worry about. You can easily snug this into your bedroom and you don’t have to worry about a thing. But fuel-based heaters must not be let on through the night. Left unattended and you risk inhaling a large number of toxic fumes which harms you and your family. Not to mention, fire hazard of a heater that burns on actual fire is high. Tip it over and no auto will be able to shut down the fire. Keep anything too close and they will catch on fire soon enough. Maintenance of a fuel-based heater is heavy. You need to change the wick, buy fuels and try to be efficient in it. There are also parts that might require changing if you do not follow the right instructions when burning the fuel. An infrared heater will require as simple as a wipe every week to prevent dust and dirt from piling up on the system. The best infrared heater for you will depend on your needs and maybe even style preference. But always keep in mind that infrared heaters are not always good space heaters, thus, you do not search them thinking they will keep the freezing basement warm all time. But they are safe, which makes them okay to be let on through the night. If you want that extra quietness in the room, EdenPURE is the best choice to get. The rest have different heating options that allow you to save even more on your electricity bills. They also have different designs as well as features, like toddler locks. Most infrared heaters manufacturers claims have to be crosschecked because they are often exaggerated. But they are great heaters for individuals. Make sure to check our safety tips and stay warm this winter!